Welcome to Helene and Company Inc.
"Be a Guest at Your Own Event"
Helene & Company, Inc. provides full-service event planning and management. Specializing in weddings, bar and bat mitzvahs and special events - both corporate and social. Helene & Company, Inc. is known for their attention to detail and for their ability to make the hosts feel like guests at their own celebration. Since 1995, Helene has assembled a vendor list that features the best and brightest chefs, designers and musicians to ensure an unforgettable experience. Let Helene put you at the top of your guest list. Why choose Helene and Company Inc.? 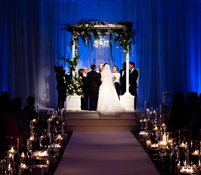 The answer is simple: "Helene procures the best vendors to fit each client's vision and budget and coordinates the elements to produce a spectacular event. According to the suppliers and artists she works with, Helene sets the bar high and inspires them to produce their very best work. Her vision ignites a synergy that results in truly memorable events." Ask Helene & Company Inc.
An experienced event planner can save you money in the long run, and help you avoid costly mistakes. I negotiate better pricing for my clients, review and negotiate all contracts, manage the budget, and handle all of the details. Simply stated, I take over the "business" side of the event planning and execution allowing the client to enjoy this special time. Helene & Company Inc. charges a flat fee negotiated upfront, we also pass along all vendor discounts to our clients. On the day of the event, will Helene and Company Inc. be willing to oversee the entire event? My personal presence is part of the deal. As much as I try, I cannot be in two places at one time. My staff and I will be there the day of your event. Can you help us stay on budget? Helene & Company Inc. will manage the budget and handle all of the details to ensure we stay with in the budget. I work with an outstanding team of trained assistant's to help during the event. "There is only one word to describe Rachel and Jonathan's wedding-PERFECT! The entire weekend exceeded our lofty expectations. Your help and guidance in the selection of vendors and venues was just what we needed. You're attention to detail was impeccable."